The Steelers sustained long drives and dominated the time of possession against their division rivals. Ben Roethlisberger was mistake free and played a solid game, completing 28 passes for 270 yards. Antonio Brown was the most targeted receiver at 11, but the Ravens did a decent job of limiting him. He ended the game with five receptions for 42 yards. James Conner impressed and for the fourth straight week, he rushed for over 100 yards. He also impressed as a receiver, catching seven passes for 56 yards and a touchdown. If Conner can continue to produce in Le’Veon Bell‘s absence, then Steelers fans may soon forget about their former All-Pro back. The Steelers had three different players record a sack and none of them where named Cameron Heyward, yet Heyward was the one defender who was consistently pushing the pocket and giving the Ravens’ offensive line issues. The most consistent defender in coverage was slot corner Mike Hilton. He recorded a pass defense, and he quickly made the tackle against the Ravens receivers every time he was targeted. The Baltimore defense struggled to get off the field, as the Steelers converted a whopping 63% of their third downs. There were only a few bright spots for the defense, and one of them was cornerback Jimmy Smith, who played Brown well and recorded two pass breakups. Baltimore didn’t generate much pressure against Big Ben, partly due to their quick passing game but mostly due to Pittsburgh neurtrilizing the Ravens’ pass-rush. Matthew Judon was their most effective pass-rusher, recording the team’s only sack and generating a couple of pressures. Joe Flacco had a limited day as a passer. While he didn’t make any major errors, he struggled to push the ball downfield. 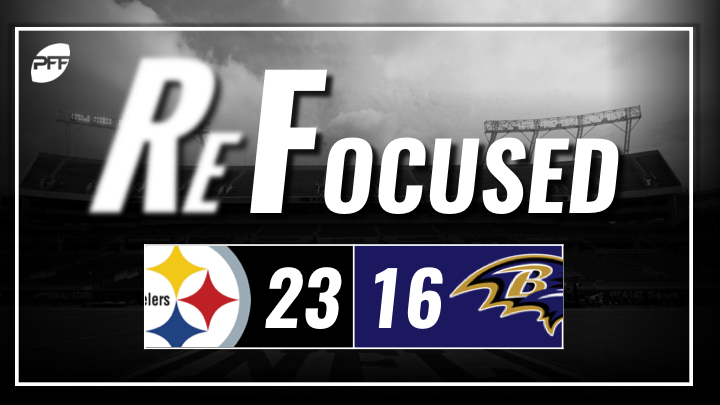 As a result, the Ravens had to slowly move down the field and were unable to do so consistently. The Ravens couldn’t establish the running game, as the team averaged just 3.8 yards per carry. Alex Collins made a few good gains early in the game when the Ravens put Lamar Jackson at quarterback, but after the first couple of drives, his production all but dried up. Pittsburgh converted over 60% of their third downs and dominated time of possession. That combination led to a winning formula, as they split the season series against their division rival. Conner impressed again, racking up over 160 yards from scrimmage. The Ravens couldn’t consistently move the chains, as they only gained 18 first downs compared to the 27 of the Steelers.